Bedside Lamp: Sporting a beer bottle for a shade, a galvanized pipe body, and a wire-rigged water valve acting as a switch, this will make sure you've got enough light to read six Baby-sitter's Club books before realizing that Mary Anne needs to dump the hell out of that shady Logan character. 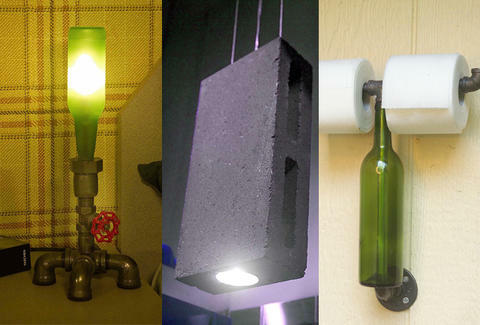 Concrete Block Pendant: Seemingly ignoring the glaring question of "what could possibly go wrong?! ", this lamp has a room-brightening halogen bulb housed inside a 30lb cinder block, which hangs from the ceiling via two thin steel cables. But seriously, it’s 100% safe, you should buy this thing. Bottle TP Holders: These two-ply caddies come as either a wine-bottled two-roller or a single-rolled beer bottle jawn, perfect for cleaning up after...wait for it! !...a massive Schlitz. If your abode's still rocking track lights, hahahahaha ZAL's got you covered with halogen-ready coffee mugs, oil filters, and beer cans, making them the first cans you don't have to quickly throw a blanket over when mom and dad pop in unannounced.